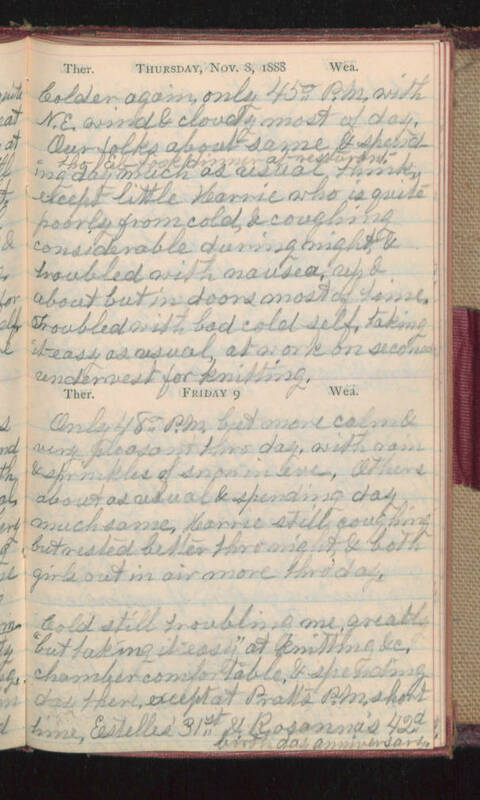 Thursday, Nov. 8, 1888 Colder, again only 45° P.M. with N.E. wind & cloudy most of day. Our folks about same & spending day much as usual think, tho El- took dinner at restaurant, except little Karrie who is quite poorly from cold, & coughing considerable during night, & troubled with nausea, up & about but indoors most of time. Troubled with bad cold self, taking it easy as usual, at work on second undervest for knitting. Friday 9 Only 48° P.M. but more calm & very pleasant thro day, with rain & sprinkles of snow in eve. Others about as usual & spending day much same, Karrie still coughing but rested better thro night & both girls out in air more thro' day. Cold still troubling me, greatly "but taking it easy" at knitting &c. chamber comfortable, & spending day there, except at Pratts P.M. short time, Estelle's 31st & Rosanna's 42d birthday anniversary.